Headphones for sports give athletes a huge advantage in performance. Typically, they’re waterproof (AKA sweat proof!) and are shaped to rigourous movement. You don’t want your headphones constantly falling out of your ears while you’re training! There’s a variety of sports headphones out there, many of which are designed for specific sports or activities, such as swimming and running. Music helps athletes, both amateur and professional, train and prepare for a game, race or other competitive sporting event. Michael Phelps is a great example, as he always had his headphones in while getting ready for his next big swim at the Olympics or anywhere else. In-ear versions are certainly chicer, as over-the-ear pieces tend to scream “I love the ’80s!” However, over-the-ear versions may offer better sound quality over their stylish counterparts. In-ear versions that are best for training, as over-the-ear options are probably best suited for sports and sports-related activities where you aren’t going to be moving at crazy speeds, such as yoga, horseshoes and golf. Or, you know, croquet–basically any afternoon “garden” sport. Swimmers around the world rejoiced when waterproof headphones were brought into the world. Designed for swimming, surfing, stand-up paddling, kayaking, canoeing and other water-related sports, waterproof headphones allow athletes to enjoy their favorite music no matter how many feet of water they’re under. Why surfers use them is a bit questionable, as wouldn’t it be necessary to hear large waves about to engulf them or people shouting “Hey, there’s a shark behind you!!”? Regardless, there are several versions to choose from, including ‘sport wrap’ ones that wrap around the back of the neck and work well during vigorous activity whether in or out of the water. Underwater Audio’s Aquasonic headphones or Surge Sportwrap Waterproof headphones are good choices. Other waterproof options include flexible versions designed for durability no matter how much sweat is pouring out of you. 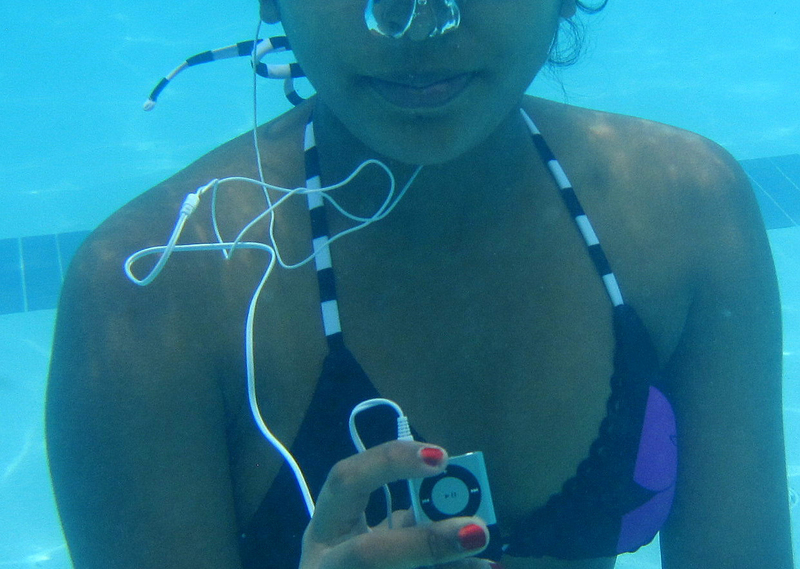 Underwater Audio also offers Swimbuds, a short cord waterproof headphone. The extra short cord on these headphones means there’s no extra cord to wrap up or get tangled in. Sports headphones can range in price from a few dollars to a few hundred dollars. When shopping for the perfect pair of headphones, it’s probably a good idea to spend a little extra. Sure, a $7 pair of headphones seems like a good idea, but such headphones may also fall out of your ears easily or offer just a little too much bass. Treble performance may also be lacking, which means the headphones aren’t going to feature a whole lot of clarity. Even the pricier versions can feature plastic ear thingies that feel uncomfortable or provide lackluster sound. The bottom line? Do your research before deciding to purchase a pair of sports headphones. Read reviews of the same product on several difference websites, and be sure to read all of them. Ask friends and family members who use sports headphones for tips and advice, and see what people are saying about the product on social media if possile. After all, you don’t want to spend a ton of time trying to return headphones when you should be in the pool or on dry land working out! What do you think is the most important quality in headphones for sports? What are your favorite headphones for sports?